Snowmelt is an important component of any snow-fed river system. The Jhelum River is one such transnational mountain river flowing through India and Pakistan. The basin is minimally glacierized and its discharge is largely governed by seasonal snow cover and snowmelt. Therefore, accurate estimation of seasonal snow cover dynamics and snowmelt-induced runoff is important for sustainable water resource management in the region. 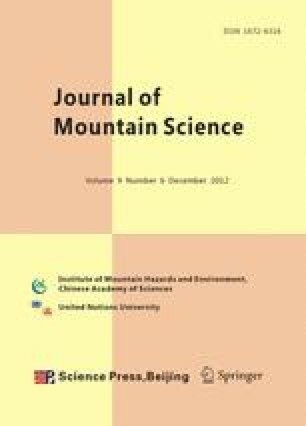 The present study looks into spatio-temporal variations of snow cover for past decade and stream flow simulation in the Jhelum River basin. Snow cover extent (SCE) was estimated using MODIS (Moderate Resolution Imaging Spectrometer) sensor imageries. Normalized Difference Snow Index (NDSI) algorithm was used to generate multi-temporal time series snow cover maps. The results indicate large variation in snow cover distribution pattern and decreasing trend in different sub-basins of the Jhelum River. The relationship between SCE-temperature, SCE-discharge and discharge-precipitation was analyzed for different seasons and shows strong correlation. For streamflow simulation of the entire Jhelum basin Snow melt Runoff Model (SRM) used. A good correlation was observed between simulated stream flow and in-situ discharge. The monthly discharge contribution from different sub-basins to the total discharge of the Jhelum River was estimated using a modified version of runoff model based on temperature-index approach developed for small watersheds. Stream power — an indicator of the erosive capability of streams was also calculated for different sub-basins. An erratum to this article can be found at http://dx.doi.org/10.1007/s11629-012-2800-0.